Aiming to provide present and future healthcare professionals with specialized skills to compete in the rapidly changing, highly competitive health industry, Gulf Medical University (GMU), Ajman, a leading medical University in the Middle East region, has entered into a partnership with Vita-Salute San Raffaele University, a leading University in Italy, for strategic collaboration in the areas of academic and clinical cooperation as well as research. A MoU in this regard was signed between both the institutions on 28th January 2019, at the Arab Health 2019 exhibition in Dubai. Prof. Enrico Gherlone, Dean of Vita-Salute San Raffaele University and Prof. Hossam Hamdy, Chancellor of GMU signed the MoU representing the respective institutions. The collaboration will immediately be activated through the joint delivery of the Executive Master in Healthcare Management and Economics (EMHME), offered by GMU’s College of Healthcare Management & Economics. The MoU further seeks to facilitate cooperation in mutually beneficial areas including joint programs and conferences, in addition to promoting student and faculty exchange. It also envisions undertaking joint research projects and enabling mutual exchange of researchers. 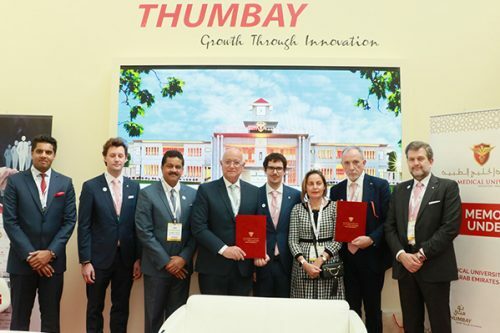 The agreement also seeks to promote clinical cooperation between the Academic Health System hospitals of Gulf Medical University, the Thumbay Hospital network and the Gruppo Ospedaliero San Donato network of hospitals. GMU’s College of Healthcare Management & Economics is the first full-fledged college of its kind in the Middle East region, offering bachelors and masters programs designed to cater to the constantly growing health industry. The new college offers two programs: Bachelor of Science in Healthcare Management and Economics (BSc. HME) – a four-year program and Executive Master in Healthcare Management and Economics (EMHME) – a 12-month program designed to benefit middle to senior level professionals in the healthcare industry. The college is a member of the European Healthcare Management Association, and enjoys strong ties with industry partners in the UAE and the GCC, as well as in India, US and Africa. Admissions are now open for the Master’s program starting March 2019 and the Bachelor’s program starting September 2019. These programs will support all aspects of the healthcare industry including finance, economics and insurance.